It’s amazing how a few pointers can send your creative instincts into overdrive. Yvonne Milsome has been a regular on DIYframing training sessions, visits to open days and seminars. It was at our Summer 2008 open day that she heard David Wilkie talk about how he uses various mount cutting and framing techniques to give his pieces a unique (and award winning) quality. It was ahead of the launch of the first set of master classes that David ran for us in November last year. Clearly, what Yvonne saw and heard made a big impression, inspiring her to create a piece of framing that took her a long way from the type of work she had done before. 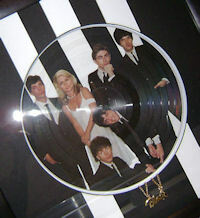 To add to the pressure the customer was her husband: the project framing a limited edition Blondie record (image on vinyl). 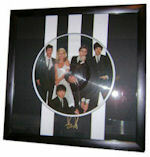 As with all projects, the design and colour palette for any piece of picture framing is taken from the item being show. In this case, Yvonne had a record and pendant to work from. 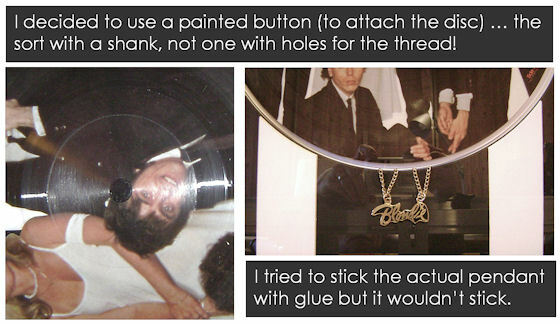 However, because the artwork was a picture disc, whilst there is the advantage of good visual cues, there are also the practical problems of how to attach it in the frame, keeping it all away from the glass. For Yvonne, the planning started with sketches and ideas for how to achieve the look she, and her client (husband), were after. The colour scheme was an easy decision: black and white. The choice of mount was a black, black core with a circular aperture cut: the record would sit within the aperture on a white mount background. In fact it was the first time Yvonne had used her circle cutter on a major project. The stripes on the disc were always going to be featured on the mount. The first thought was to paint them on, trying to mimic the grooves using a “combed” effect. The “client” felt that would be over complicating things: the second idea was to use the sculptural effect of strips of white mount stuck down on the black core base. Because strips of foam core were used under the black mount as spacers, the record sat at a distance behind the face of the black mount. This caused real issues with perspective. What seemed in the first instance to be quite simple, actually took several attempts, before eventually finding the correct width and positioning of the stripes. They not only actually had to line up with the record’s stripes, they also had to appear to line up with them when seen in the frame. Yvonne used PVA (wood glue) to hold the stripes firmly in place. The Blondie chain was draped over the edge of the circular aperture and the loose chain taped securely behind. In a similar way to medal framing, the piece remains reasonably well anchored, but tends to move from side to side, so the back of the pendant needed fixing to the mount. “I tried to stick the actual pendant with glue but it wouldn’t stick, so double sided tape came to the rescue once more.” Another alternative could be a small dab of silicone sealant / adhesive. For the picture frame, Yvonne used a pine moulding with a slight “cushion” front. An ebony stain was used to colour the timber, with a Liberon, dark oak wax final finish to give depth and sheen. The rebate depth is important on this type of work, needing a in excess of 15mm to accommodate the various layers of mountboard, glass, foam spacers and backing. What Yvonne and her client have ended up with is an outstanding piece of bespoke framing, with a unique style of presentation and design, totally suited to the artwork. It really illustrates how far you can go with your own picture framing and how it often takes you in new directions just by rising to a challenge. “Framing is indeed going well – a steady stream of work through colleagues, neighbours and friends. I’ve only just put an ad in a local shop to see a) how much is out there and b) if I could cope.” We sincerely thank Yvonne for taking the time to tell us about her work and allowing us to feature one of her projects; no doubt the first of many. We also wish her well with the burgeoning business.